Fifty years ago, the late trailblazer became Texas Tech's first African-American graduate. 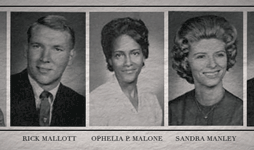 In the spring of 1964, Ophelia Powell-Malone received her degree from Texas Tech University. None of her fellow graduates looked like her, but on that day Ophelia blazed a trail. 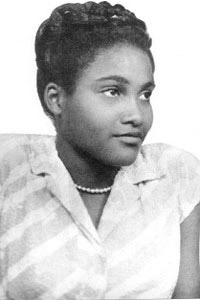 Ophelia was the first African-American to receive a bachelor's degree from Texas Tech. She received a degree in home economics with a concentration in home nursing and health care. Texas Tech became integrated in 1961 after several federal court cases ruled students could not be denied admission on the basis of their race. Despite resistance—a Daily Toreador article from February 1955 reports that during a student debate, 35 percent of the student/faculty audience was against integration—the Texas Tech Board of Directors voted to consider all applicants to the university equally. Maurice said his family, along with supportive administrators, faculty and students, helped make his sister's dream possible. Ophelia wanted to be a nurse all her life. Maurice recalled one day during his childhood when his sister came back to the family home in Littlefield from Texas Tech in her white nurse's uniform. Ophelia was born near Austin in 1931. She graduated from Anderson High School and studied at Huston-Tillotson College before transferring to Texas Tech. Upon graduation from Texas Tech, she worked in Coldspring, Texas and Hobbs, N.M., in the public schools, at Langston University as a dietician, and in nursing homes in Houston and Lubbock. 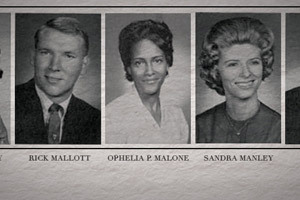 Ophelia had one son, Leslie K. Malone. She passed away Sept. 2, 1979, at the age of 48, but her legacy lives on. The Lauro Cavazos & Ophelia Powell-Malone Mentoring Program (Mentor Tech) is named in part for Ophelia. Cory Powell (who is not related to the Ophelia Powell-Malone family) is co-founder and director of the program as well as a Texas Tech alumnus. He said Ophelia's impact on students in the program as well as the university cannot be overstated. Mentor Tech seeks to enhance the quality of the educational experience of students from underrepresented populations through programs, services, advocacy, and campus and community involvement. The program pairs students with faculty and staff members to assist them in their academic, social and cultural adjustments to Texas Tech. More than 2,100 students have been served through the program. In the last eight years, nearly 800 Mentor Tech participants have graduated from Texas Tech and the Texas Tech University Health Sciences Center. The program's participating student average retention rate (86 percent) is higher than the university's overall rate, and the program has awarded close to $100,000 in scholarships since its inception. Cory said Ophelia's older brother William donated the first funds to establish scholarships for Texas Tech students in honor of his sister. Although William passed away last year, his son Darrell said Ophelia would be incredibly happy and proud to see Mentor Tech flourishing. Darrell said his parents, William and Doris, believed in education: William ultimately served as dean of students at Jarvis Christian College in Hawkins after a long career in science education, and Doris served as a school counselor for Houston, Lubbock, Nacogdoches and Levelland school districts. Doris followed Ophelia as one of the first African-American graduates from Texas Tech when she received a master's degree in education. She passed away in 2010. 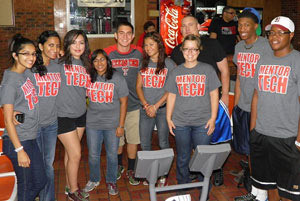 Today, Texas Tech has increased its recruitment and retention of underrepresented students through programs like Mentor Tech. In 2012, the Education Trust published a study that analyzed college enrollment data from 2004-2010. Texas Tech was recognized for closing the graduation gap between Hispanic and white students, and was ranked ninth in the “Top 25 Gainers in Black Student Graduation Rates among Public Institutions, 2004-2010,” increasing its graduation rate among African-Americans by more than 18 percentage points. Mentor Tech seeks to enhance the quality of the educational experience of students from underrepresented populations through programs, services, advocacy, and campus and community involvement. President M. Duane Nellis said Ophelia's success paved the way for progress at Texas Tech. Darrell said that in terms of diversity in higher education, the education system still has ways to go. In spite of this, he said Ophelia would be pleased that programs like Mentor Tech exist to help students overcome difficulties like she encountered in her education. For Cory, who has grown close to Ophelia's family throughout the years, remembering her not only helps to recognize Texas Tech's past, but also gives students today an example for how to go forward in their lives. The Lauro Cavazos & Ophelia Powell-Malone Mentoring Program (Mentor Tech) was introduced during the fall semester of the 2002. The program seeks to enhance the quality of the educational experiences of students from underrepresented groups through programs, services, advocacy, and campus and community involvement. For additional information, contact the office at (806) 742-8692 or review the programs fact sheet.